Karen O’leary is definitely one of the most patient people on the planet. She spends most of her days cutting away at thick white watercolor sheets of paper, until she creates jaw-dropping replicas of conventional city maps. While you could easily mistake Karen’s hand-cut maps with laser-cut ones, the amount of time and patience she puts into every one of her works makes them unique masterpieces. For each one of her maps, the artist spends a great deal of time drawing it in detail, and only after begins the painstaking process of cutting. 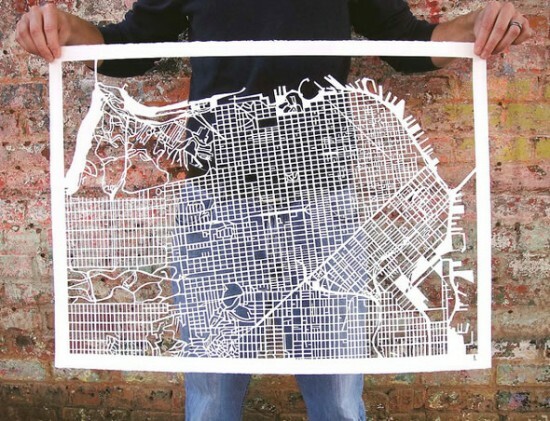 If you’d like to own one of Karen O’leary’s intricate hand-cut paper maps, you can find a wide range of cities, from Madrid to Sydney, at her online Etsy shop. While the $1,100 price tag may seem a bit discouraging, judging by the amount of effort Karen puts into her art, you’ll find it’s a bargain. via Hand-Cur Paper Maps by Karen O’leary | Oddity Central – Collecting Oddities.